Angel Investor - What Does It Mean? What is an "angel investor"? 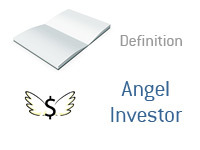 What is the definition of an "angel investor"? Angel investors are absolutely critical for the average startup company. Most start-up companies are launched using money that is scrounged together from friends and family, as well as from the savings accounts of the people who are starting the company. This is usually a fairly small amount of money - just enough to get the company off the ground. As the company begins to grow, additional funds are needed. The company is still too small and unproven to attract money from venture capital firms, so angel investors are contacted to invest in the company. Angel investors are wealthy individuals who are putting their own money on the line to help fund the company. In exchange, of course, they usually ask for equity in the company. As the company starts to mature, venture capitalists can be called upon to invest substantial sums of money in the company. Angel investors can do VERY well for themselves if a company ends up going public or getting purchased. However, there is also a great deal of risk involved, as angel investors tend to put their money into very young and unproven companies. Angel investors are looking to hit the lottery every once in a while - if they do, then they are more than happy. However, for every company like Youtube or Google, there are a thousand other firms that end up failing and not going anywhere.